Does studying for finals have you feeling anxious or stressed? 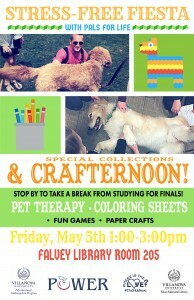 If so, be sure to join us on the second floor of Falvey Memorial Library on Friday, May 5th from 1:00-3:00 p.m. for a well-deserved study break! It’s Cinco de Mayo and we will be having a Stress-Free Fiesta featuring Pals for Life therapy animals in room 205 and a crafternoon event hosted by Special Collections librarian Laura Bang just outside of room 205. Pals for Life pets will be on-site in room 205 to interact with students and hopefully bring some comfort during a point in the semester when it is most needed. According to their website, the Pals for Life organization says, “We are a non-profit organization founded in 1985 that brings pets to those who need them throughout the Delaware Valley. 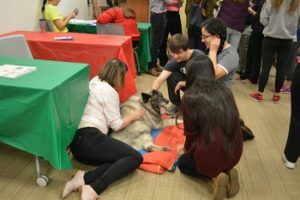 Our mission is to enable people to lead happier, healthier, more fulfilling lives through interaction with companion animals.” In their past visits to Falvey, Pals for Life pets have included dogs, cats and rabbits. Students with a therapy dog. 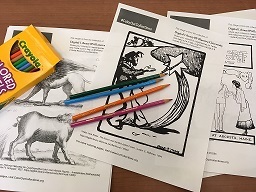 Just outside of room 205, our crafternoon event with Special Collections Librarian Laura Bang will feature coloring and paper models for your enjoyment. The coloring pages will be from various sources and WWI-era paper models (dolls, planes, and tanks) will be offered for your crafting pleasure. A tasty variety of healthy snacks will also be available to help you power through the day. Let us help you stay motivated and reduce stress! The Stress-Free Fiesta is co-sponsored by POWER, the Villanova University Advancement Ambassadors Program, Where is the Love #ItsOnUSNova and Falvey Memorial Library. The Stress-Free Fiesta poster was designed by the Office of Health Promotion and updated by Joanne Quinn, Falvey’s graphic designer. Photograph by Alice Bampton, Communication and Marketing Dept. We are committed to accuracy and will make appropriate corrections. We apologize for any errors and always welcome input about news coverage that warrants correction. Messages can be e-mailed to reginal.duffy@villanova.edu or call (610)519-3872.